Monmouth Medical Center (MMC) presented a ceremonial check representing a $20,000 donation to Habitat for Humanity in Monmouth County during a January 8 ceremony at the hospital. 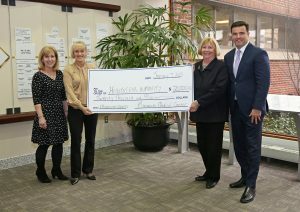 This is not the first partnership for Monmouth Medical Center and Habitat for Humanity – Monmouth County. MMC has supported and continues to help in the building of three new homes in Monmouth County. An affordable two family home was completed in Atlantic Highlands in the spring of 2018. Two three bedroom/one bathroom homes are also being built in the Troutman’s Creek neighborhood of Long Branch. Located in Long Branch, N.J., Monmouth Medical Center, an RWJBarnabas Health facility, along with The Unterberg Children’s Hospital at Monmouth Medical Center, is one of New Jersey’s largest academic medical centers. From its earliest days, Monmouth Medical Center has been a leader in surgical advancement and has introduced many technological firsts to the region, including robotic surgery and other minimally invasive techniques. Monmouth Medical Center is the only hospital in Monmouth and Ocean counties to consistently receive an “A” Hospital Safety Score by The Leapfrog Group, an independent national nonprofit organization of employer purchasers of health care and the nation’s leading experts on patient safety.